Golden Film Classic Oils are recommended for use in veteran, classic and vintage cars, motorcycles, commercial vehicles and tractors, where engine design and tolerances prohibit the use of modern multigrade, high additive level oils. Modern dispersant additives keep combustion chamber contamination suspended in the lubricant, allowing full flow cartridge filters to remove it. Early oil filtration, usually in the form of a mesh gauze or strainer, is not efficient enough to remove this suspended material. 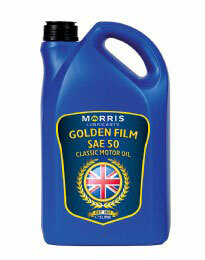 Golden Film Oils are low dispersant oils and allow the suspended matter to drop harmlessly into the sump. Golden Film Classic Oils also have enhanced anti-foam properties ensuring optimised performance in motorcycle and automotive classic gearbox designs.